Mother's Day Fun and a Freebie! - Fern Smith's Classroom Ideas! Mother's Day Fun and a Freebie! Tuesday Teacher Tips: Mother's Day Fun and a Freebie! Michelle, from Teach 123, and I ran one of my very favorite post, Tuesday Teacher Tips, each Tuesday. Today is a rerun fun of the post for you to download the freebie! Click here to see the previous weeks' Tuesday Teacher Tips. Mother's Day is Sunday, May 13th this year. I've spent most of my career in Title One schools. Mother's Day is a day to celebrate, but also a day to tip-toe around. I had a few expressions I use to repeat over and over and over again, but I did so because I didn't want to hurt any little person's feelings. "Take this home and have someone over 18 sign it." "Read tonight to Mom, Uncle Sue, Aunt George or your dog for 20 minutes." "Anyone can be your special someone on Mother's Day, your Mom, your Grandma, your Aunt, the nice lady next door, even Mrs. Smith." I had such long sentences and delivered them with such silliness because life is not always easy for these children, sometimes school is their only place for joy. 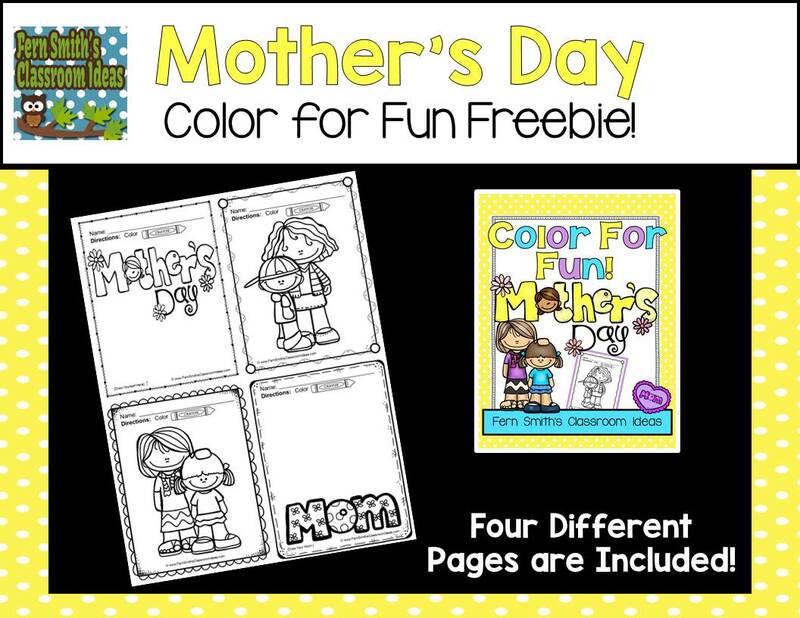 So that being said, today's post is a FREE Color For Fun for your class, Mother's Day Fun! Click here to follow my Mother's Day Pinterest Board for Educators.. Follow Fern Smith's board Mother's Day on Pinterest.